She came one night with a raw chicken. I knew she’d be staying a while. And I welcomed her into the quiet of our little stone house. John was away in London. Or Edinburgh, perhaps. And even with the woods and the beaches to walk, the days and nights grew long, just Baby and me. Soon the oven warmed the kitchen, and the smells spread through the house. And she sat with me while I fed and changed him. Spoke with me, listened, like she’d nowhere else to go. And when Baby was down, and our bellies were full, she sat a bit longer just to chat. She and another friend, as if it were nothing. They came with boxes, newspapers, and bags, and within a few days the house was wrapped and packed, and it was nothing I could have done on my own, not me and Baby, who climbed in and out of boxes, unpacking what I’d packed. And I was grateful, oh so grateful, for their help. But it was more than the job, of course, more than helping me move house. that spoke volumes to my tired mama heart. Saying that, I loved the help. Acts of service is a love language I so appreciate and understand. But not every mama loves someone showing up with a dust rag and a mop. An offer to help clean her house can make her feel inadequate. Like she’s failed as a homemaker and it’s clear to all the world that she’s drowning in laundry and dust. 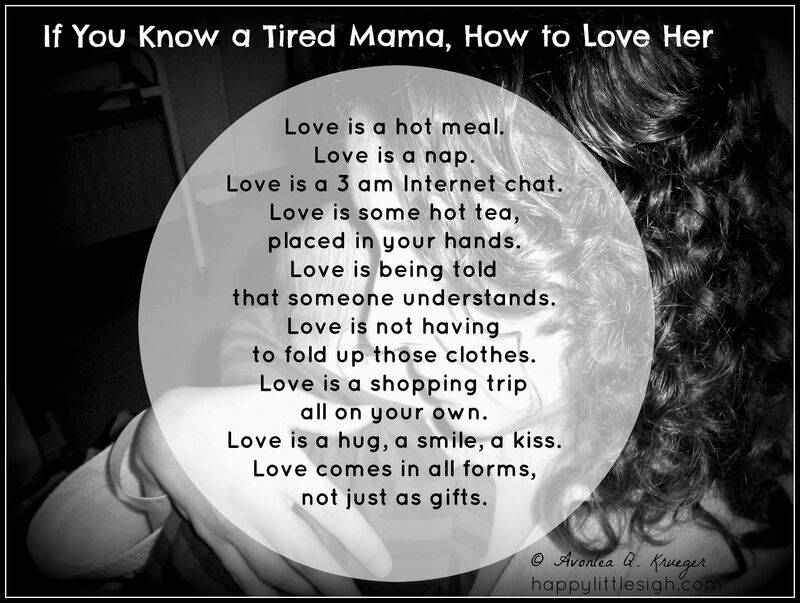 first find out what kind of love* speaks to her tired mama heart. If it’s Acts of Service, an offer to fold her laundry, wipe down the high chair, or wash her dishes will have her heart skip a happy little beat. And if you sit and chat with her while you do it, while she feeds the baby, she’ll appreciate it even more. Have a bit more time? Offer to sit with the children while she grocery shops solo. The sacrifice of your time and hard work will make her feel cared for more than anything else. If it’s Quality Time, bring some muffins, just spend time with her, chaos and all. Or if you can, whisk her out for coffee and a chat. Or offer to join her on a trip to the park with the children. What this mama craves is your active presence. It doesn’t matter what you’re doing, she just wants to see you and to build your friendship, whatever you do together. 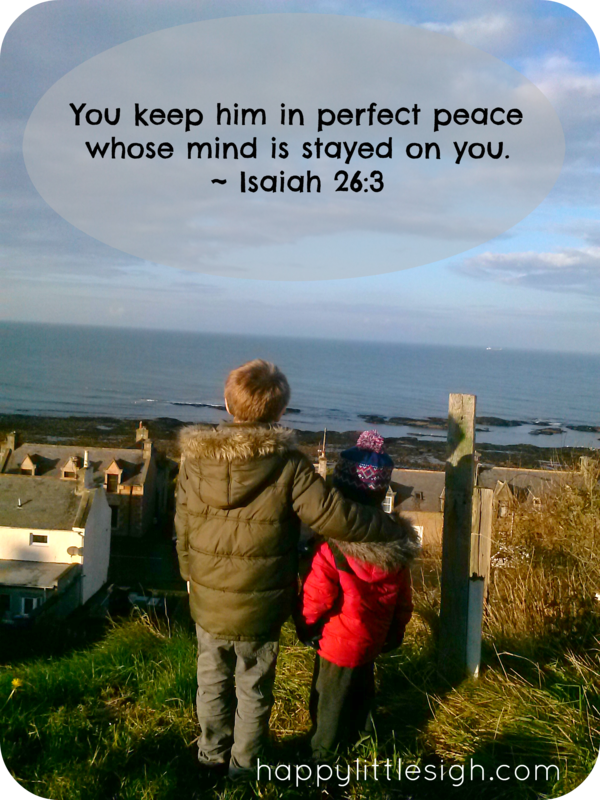 If it’s Words of Affirmation, this mama needs encouragement, truth, and peace spoken into her life. Compliment her on her strengths, and what she’s doing right as a mother and wife. Tell her how you value her friendship. Remind her of God’s love for her, His child. If you can’t tell her in person, call or send a card. If it’s Gifts, this mama would love you to turn up with a pot of soup and a loaf of bread. 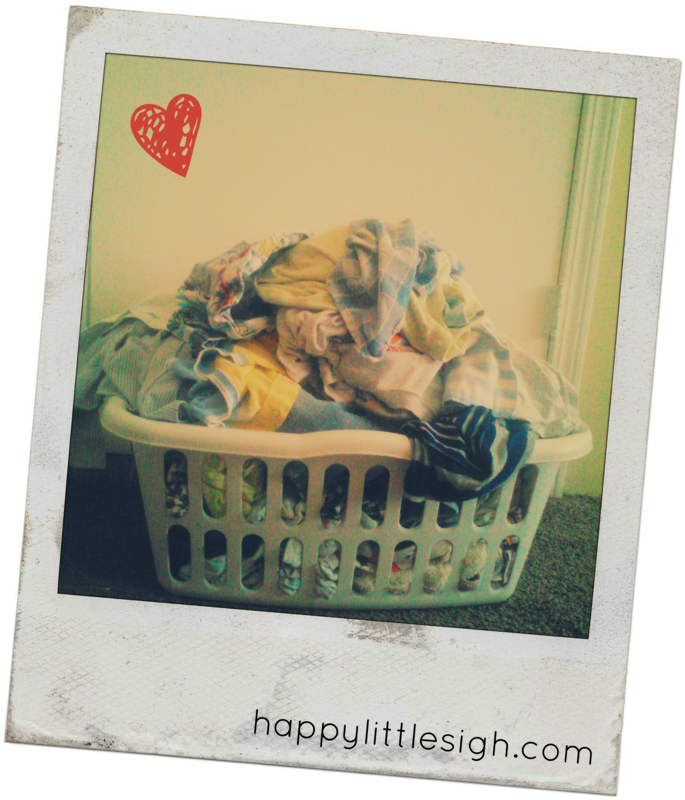 A bag of clothes that your little one has outgrown. A new diaper bag to replace hers, which is so worn out. Anything to let her know you were thinking of her. She probably wouldn’t turn down a gift certificate to her favourite restaurant or spa, but the price is not the issue. She’ll just be delighted to know you were thinking of her, whatever gift you bring. If it’s Phyisical Touch, what this mama might need more anything else is a hug. Being the mama (or daddy!) of little ones is not an easy task. Not a nine-to-five kind of job. It begins from the time we open our eyelids to the time we lay down our weary heads (and often continues through the night as well). We long to raise our children to be rich in faith, love, and good works, but such important work can seem overwhelming when running on such a little bit of sleep. So if there’s a tired mama in your life, find a way to help her be the faithful wife and mama she so longs to be by showing her love in a way that will strengthen her and help her run strong. Find Happy Little Sigh on Pinterest! It’s been six months, but I’m still talking. Still telling what happened–what she did–with as much excitement as if I’d just stepped off the train. January, Little Bear just a month old, still waking often, still calling me from shallow sleep to hold him, back-bent and weary, as I rock, rock, try to keep my head from nodding as I feed him off to sleep. January, and I’m still recovering from his birth, still tender and swollen, still feeling lost as I try to wade my way through the emotions that come with newborns and returning to the country that was home for eight long years. January, and in spite of craving sleep like an addict, I feel anxious to do some shopping for the belated Christmas we’d be sharing with my family back in the States. I couldn’t drive, but there are trains there, and I decided catch one, just me and Little Bear, to Inverness, where we used to live and where one can find such delights as Primark, Debenhams, and Marks & Spencers. I was set to do the return trip in a day, but the night before, I spoke to a friend from our old church. A trendy grandmother with a soft young voice, smiling eyes, and a penchant for the color blue. She convinced me—without much effort—that Little Bear and I should stay the night. Have two days in town instead of one. The trip began disastrously. I spent half the time trying to ignore the stressful cries of a newborn, and the other half in the dressing room feeding and changing his nappy. I would have had to go home empty-handed, frustrated, in tears. But instead came my friend with her car to meet me and whisk me and Little Bear off to her home for a hot dinner (she held the baby while I ate! ), endless cups of tea (she said I must keep my strength up! ), and a heart-to-heart conversation in a soft chair (I sat while she bathed the baby!). And that’s only the beginning. I haven’t yet mentioned the fruit and water bottles in my room in the event I needed a late night snack, the electric blanket that had been turned on to keep my bed warm and waiting, or the new home décor magazines that were set out in case I wanted to take a look. I laid my head on my crisp white pillow that night with a smile on my face and peace in my heart. Just a night in that house and I felt rejuvenated. Encouraged. Loved. Ministered to in every way. And I could say my friend is just like that. Just the sort of person to convince you she liked sleeping on the floor and that you really should have her bed. And perhaps that’s a little bit true. But if you’ve seen her Bible then you’ll know it’s also a little bit more than that. Book marks sticking out like porcupine quills. Notes added to the margins in her tiny, dancing hand. She spends a great deal of time with that book, I gather. Probably a great deal of time on her knees, too. And somehow, in a way that surpasses all comprehension, spending time with that book has the power to transform us. Help us stop thinking of our own needs and see the needs of others. 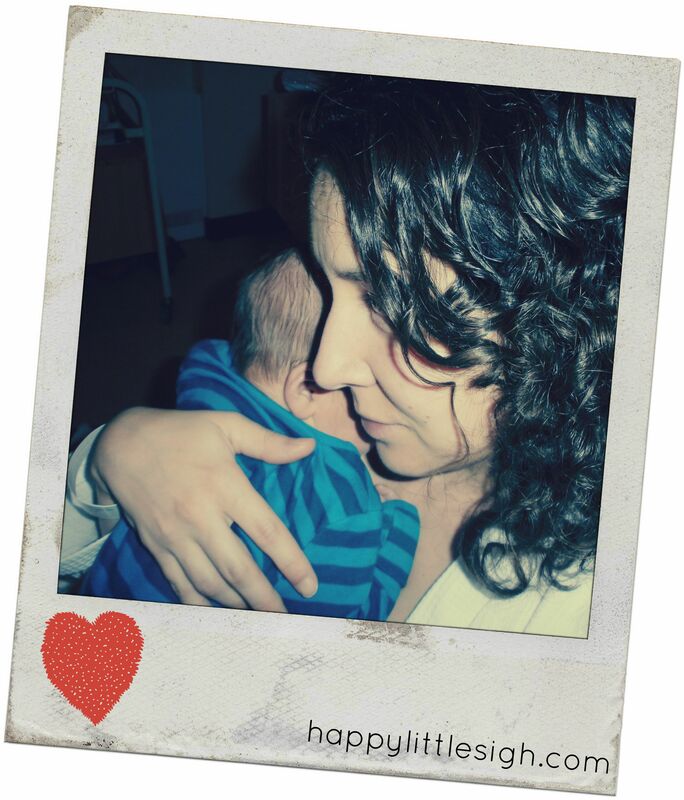 Help us see what a teary-eyed, bone-weary Mama needs more than anything else. I could sleep one thousand sleeps. One thousand all together, my own sleeping beauty tale. have left me feeling that I’ll never be rested again. Not ever in my life. and life will resume a normal pace. and for however long it lasts. what tomorrow’s normal might be. There have been times of sameness . . .
My college years, with the grueling cycle of classes, homework, and my job. and my world became bigger than I’d ever dreamed. there came a bit of sameness again. (someone remind me of that again!?!?). Then came our first cottage. And since the Professor’s birth there has been that sameness that you’ll know about if, like me, you’re a stay at home mum. the endless mopping up of spilled drinks. Then came one, two, three more babies . . . But with a trans-Atlantic move stuck in the middle. in the country of my birth. But life always settles, when it can, into sameness and routine. trying to find normal again. For however long it lasts. But I’m learning not to rely on “normal” to give me peace. It can only be based on the eternal. are not unknown to Him.